The Russian president has blasted attempts to rewrite the history of WWII and hide the crimes of Nazism as inadmissible and immoral, adding that people who do this often try to distract attention from their nations’ collaboration with Hitler. “It is hard to imagine that real ‘death factories,’ mass executions and deportations have become a terrible reality of the 20th century, that they were cold-bloodedly and thriftily organized in Europe that seemed to be civilized back then,” Vladimir Putin said as he spoke in the Jewish Museum and Tolerance Center in Moscow at the event dedicated to the 70th anniversary of Auschwitz’s liberation. Putin urged the audience to always remember the terrors of the Holocaust, reminding everyone that, according to the Nuremberg Tribunal’s verdict, the Nazi policies killed 6 million Jews. The president said that such crimes have no statute of limitation. “We bow our heads before the heroism of the Red Army soldiers and officers who defeated the Nazi Germany and stopped the fearful extermination machine,” the Russian leader stated. Putin emphasized that the Russian people bore the greatest weight in the war against Nazism as 70 percent of the Red Army troops were ethnic Russians. However, the president also acknowledged the effort and heroism of other peoples. “We all know the danger and the destructive potential contained in the policy of double standards, indifference and lack of concern about other people’s fate. A typical example is the current situation in the south-east of Ukraine where civilian residents of Donetsk, Lugansk and other cities and towns are being killed for many months by cold-blooded attackers,” Putin noted. 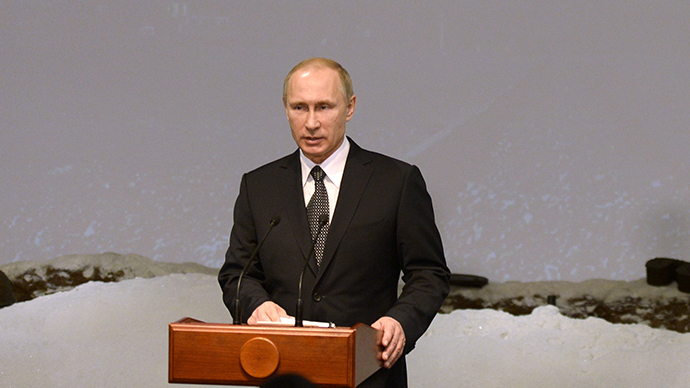 Putin’s speech in the Jewish Museum was made as the world celebrated the 70th anniversary of liberation of Auschwitz by the Red Army in 1945. The Soviet soldiers saved about 7,500 of the camp’s last surviving inmates and disclosed to the world the blood-chilling details of the Nazi extermination machine. Auschwitz is one of the most infamous Nazi death camps, where over 1 million people were murdered during WWII. Most victims were Jews, but there were also Poles, Soviet Army soldiers and other people considered dangerous by the Nazi regime. Also Tuesday, State Duma Speaker Sergey Naryshkin, currently on a visit to the Parliamentary Assembly of the Council of Europe (PACE), laid flowers at the memorial stone to Holocaust victims located near PACE headquarters. After the ceremony, Russia’s top parliamentary official said that he was “unpleasantly shocked” by the fact that the President of the PACE, Anne Brasseur, had failed to mention the fact that it was the Red Army that liberated Auschwitz in 1945. “The head of the CE’s Parliamentary Assembly could not find two seconds to say that Auschwitz and its inmates were liberated by Red Army units. It sounded as if Auschwitz was liberated by some unknown force and as if the Nazism vanished all by itself,” Interfax news agency quoted Naryshkin as saying. He also thanked Council of Europe Secretary-General Thorbjorn Jaglandfor correcting this mistake in his speech near the memorial stone in Strasbourg.